Move over barefoot sandals – the hand chain is here. The hand chain is a combination ring and bracelet connected by a chain that drapes across the back of the hand. Hand chain bracelets can be simple chains or more elaborate combining beads, chain, charms and multiple levels of draping. If you are not familiar with barefoot sandals, they are a similar jewelry concept where a toe ring and anklet are connected by a decorative jewelry embellishment that drapes across the top of the foot. Making a hand chain is pretty straightforward. It consists of a chain bracelet, a chainring and a connector between the two. To make my hand chain, I started with 10 inches of silver chain, a basic lobster claw clasp, 20g jump rings, a charm and beads to embellish the connector, plus wire to make the bead connectors. 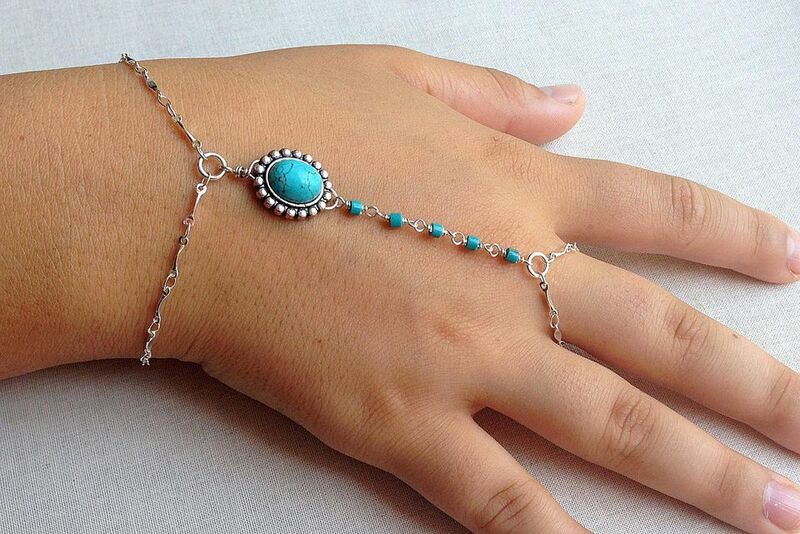 You can also make the exact same style of hand chain by stringing beads on beading wire and using crimp beads to close the strands and connect them with jump rings. Start by making a ring of chain that will fit your middle finger loosely. This is really a matter of comfort and I suggest you try making it a little loose since you can always remove a link or two and make it smaller. Also, it’s purely personal preference, but I like the way it looks when the chainring drapes slightly over the hand as opposed to the look of a stiff chain around the finger. Slide the chain around your middle finger, find a spot where it is loose enough to slide on easily and cut to length. You will be adding a jump ring to close it, so it will get a little bigger still. For my ring, I started with 3 inches of chain and then ended up removing a couple of links when I added the jump ring to close the chain. Make a bracelet that fits your wrist comfortably. A standard bracelet is 7 inches long, so that is how long I made mine. Once I made the bracelet, I found the center point, snipped one link and added a jump ring to connect the two sides. The jump ring center is where I also started adding the charm and beads that I will use to connect the bracelet and the ring. In this case, I used silver wire and wrapped loops to add a turquoise double hole charm. The last part is the connector between the bracelet and ring. To approximate the length you will need, measure from the base of your middle finger to your wrist across the back of your hand. For me, the measurement is 4 inches. As long as your bracelet and ring have a little slack, making it the length that you measure should be fine. When you close your hand, the chain will tighten up – so the connection cannot be tight or it will restrict the mobility of your hand or break. I used small turquoise heishi beads connected with wire wrapped loops to form the connector chain. If you know how to make wire wrapped loops, there is a quick way to make wire wrap bead chain by using an assembly line process. When the chain connector is the correct length, connect it to the chainring using the jump ring. Once you try it on, you may find that it is still a little too big. It is pretty easy to remove a link or two from the ring or bracelet to make it smaller - not so easy to go in the other direction depending on your design and chain choices. In my case, the ring was a little large, so I opened the jump ring, moved it over one link and found it worked better. Once I was sure, I snipped off the extra chain link. This is another simple hand chain that I made. It uses a slightly heavier gauge chain and simple loops made using the 1 step looper plier in place of a wire wrapped loop chain.